As you may have heard or read, a Harvard cheating scandal has hit the press. The university is currently investigating 125 students — yes, you read that right — for cheating on a take-home final examination held last spring in “Government 1310: Introduction to Congress.” Apparently, these students thought that in order to succeed in this course, they needed to behave like members of Congress. Ok, bad joke indeed! The cheating scandal at Harvard is the worst possible cheating scandal on record at the university in Cambridge, Massachusetts. 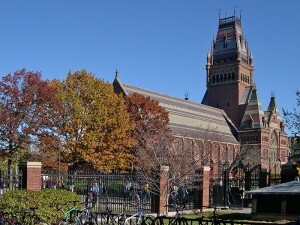 There is a Harvard cheating scandal currently under investigation at the university (photo credit: Jacob Rus). What do you think about Harvard’s cheating scandal? Do you think that students who are inclined to cheat are inclined to matriculate to Harvard? Do you think students so driven to succeed are also so driven to cut corners? Do you think a school like Brown or Dartmouth could also one day face such a scandal or are Harvard students more inclined to cheat? Harvard’s motto is “Veritas.” That means “truth.” So much for these students being truthful! May these bad apples face discipline for their academic dishonesty and may students in the future think twice before they decide to cheat. And don’t these cheating students know that while it’s so hard to gain admission to Harvard, it’s not even close to as hard to graduate? Come on now!